The Gimbal Rig, shown here in 1960, was designed to simulate the motions of a space capsule, training astronauts to control the craft. 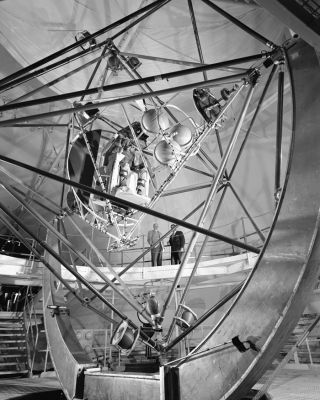 In this historical photo from the U.S. space agency, the Gimbal Rig, formally known as the MASTIF or Multiple Axis Space Test Inertia Facility, was engineered to simulate the tumbling and rolling motions of a space capsule and train the Mercury astronauts to control roll, pitch and yaw by activating nitrogen jets, used as brakes and bring the vehicle back into control. This facility was built at the Lewis Research Center, now John H. Glenn Research Center at Lewis Field.